The aroma of Bergamot Mint essential oil is sweet-herbaceous, a bit fruity, resembling bergamot essential oil. It is slightly reminiscent of clary sage oil on the dry blotter. The oil has unrealized potential as a blender's companion. It works well with lavender, sage, bergamot, and petitgrain bigarade. Bergamot Mint (Mentha citrata) will be one of your favorite essential oils. The oil is made up of two significant components, linalol and linalyl acetate. The aroma is minty with citrus undertones and very fresh! So what is significant about linalol and linalyl acetate? Wow! Pretty excellent for one essential oil. 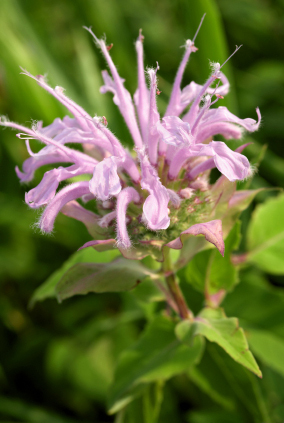 Use Bergamot Mint for cooling and calming blends (a must for menopause). It is emotionally uplifting and at the same time soothing for the nervous system. It is great for nausea, pain, to reduce anxiety and stress, and for reducing fear and panic. Amazing that this delightfully soft and gentle oil is a mint! Its chemistry is similar to Lavender and is easier on the skin than other mint oils. Use it for cooling, and in calming and soothing blends. It is emotionally uplifting and at the same time soothing for the nervous system. It is great for nausea, to reduce anxiety and stress, and for reducing fear and panic. * Great to use for hot flashes during menopause. * Try it in an inhaler. * Lovely as a perfume, in a bath blend, and in daily moisturizing lotions. Bergamot Mint essential oil is also perfect in massage oils. It brings an antispasmodic and calming effect and the aroma is wonderful. Hard to believe this delightful oil is a mint! Soft, gently floral in aroma, it reminds me of a blend of Bulgarian lavender, with just touches of citrus added. I love it in the diffuser - not energizing and stimulating like the other mint oils we carry, but gently de-stressing. Bergamot Mint oil is mostly used by perfumers for a soft heart note. It's high in linalol and linalyl acetate (like the lavenders) and is much safer on the skin than other mint oils. This oil's lighthearted floral notes make it perfect for use in the bath, or in a relaxing massage blend. It makes a wonderful perfume (which has been said a few times now), either alone, or with a touch of Vetiver to anchor it. Unlike many of the middle notes, it is complex enough to wear alone, but will need frequent reapplying. If you are looking for an non-citrus essential oil to brighten the spirits this is the one! We've had feedback from clients who have used this delightful oil to deodorize musty closets, cellars, etc. I've not tried this application yet, but it certainly is worth keeping in mind. From a safety standpoint, used in proper dilutions, it is neither irritating, sensitizing, nor photosensitizing ... much safer to use than either of the oils whose name it bears.